Nai Thon Beach is a paradise for people looking for a relaxing beach vacation, away from the crowds and the hustle and bustle. This beautiful beach is located south of Nai Yang Beach and just north of the smaller Nai Thorn Beach on the north west coast of Phuket. This peaceful spot on the north west coast of Phuket is only a 10 minute drive from Phuket International Airport. So far, the area around Nai Thon is relatively untouched from the major development which has taken place on other beaches in Phuket. Nai Thon Beach and the surrounding area is a simple reminder of what many beaches in Phuket were like many years ago, unspoilt, relaxing, and very laid back. Lets hope it can remain that way ! The beach itself is only about 1km in length and lies within the Sirinat National Park. At either end of the beach are rocky headlands, making it a great spot for snorkelling, scuba diving or just relaxing on the beach. The beach is perfect, especially during the high season when most other west coast beaches are crowded, Nai Thon is relatively quiet. And best of all there is still no jet skis or parasailing. Throughout the high season you can hire stand-up paddle boards for 500 Baht or surf boards for 300 Baht. The northern end of the beach is dominated by two large resorts. Where as the southern end is scattered with cheaper and more affordable budget hotels, guesthouses and villas. To view all resorts at Nai Thon just use the search box below. 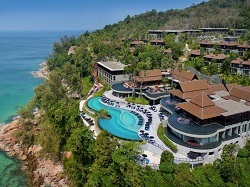 Shopping is not really on the top of things to do at Nai thon Beach, however there is a couple of mini marts, massage shops and a 5 Star ITC Master Dive Center which can be found along the beach road . 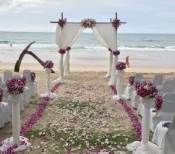 Whilst Nai Thon is a fantastic beach in Phuket to get away for a relaxing break. 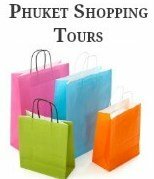 If you're looking for lots of activities and things to do, especially at night, you may prefer just spending a day exploring the area and stay at a resort on one of the busier beaches in Phuket, where you will find there is a lot more nightlife, shopping and a large selection of places to eat. However if your looking for rest and relaxation, you won't be disappointed as this is the place to be. From Bang Tao Beach you can take the coast road through to Nai Yang. Or alternatively if you are travelling from Phuket Town go north on the Thep Krasatti Road, route 402 through Thalang and turn left onto route 4031, then turn left at the Nai Thon sign and follow it for 2kms to the beach.